How far are you willing to go searching for the job you love? Hunting for the answer, Charlie Raymond spent 15 years (no, that’s not a typo) of his life doing 14 different kinds of jobs, in the process travelling around the world. From a tour guide in Zimbabwe, a cleanup job in London, a cruise manager in the Caribbean to a journalist in Dubai, Raymond tried it all. The result of his travails is Hired, Fired, Fled, a tongue-in-cheek memoir of his years trying to answer that question. Like most of us dreaming about our careers, ‘travel’ was the one thing in Raymond’s mind when he took up his first job as a tour guide at a safari in Zimbabwe. Taking inspiration from Shakespeare’s ‘the world is mine oyster’, Raymond prevailed upon his mother to get in touch with a friend at the South Africa tourism board, who in turn provided Raymond the information that the Tusker Game Reserve in Zimbabwe was looking for staff. After a long delay in securing a permit, Raymond finally landed in Harare on a tourist visa, and landed his first job at the age of 18 as a safari guide. While learning the intricacies of tracking animals, this was also the time when he came face to face with apartheid as it was still practised in the country — different pay and perks for the ‘whites’. After a row with the owner who wrongly accused him of sleeping with his wife, Raymond was ready to leave the country when he got a second chance at another game reserve. But as time progressed, Raymond realised it was time to move on. “Whatever I’d come to Africa to achieve had been achieved,” he writes. Little did Raymond realise that this was to be the first of several career changes he would be undertaking over the next two decades. “Itchy feet” is the name he gives it. Back home in England, Raymond put the next few years of his life pursuing a degree at the University at the West of England in Bristol. It was after he completed his graduation that the truth — which most of us following general degrees have also found out the hard way — that he realised that the average graduate degree is wholly inadequate to prepare an individual for life in the job market and the real world. After graduation, a chance chat with his sister Mel gave Raymond a new opportunity — to work on a film shoot. However, the glamour of the job soon faded as he was assigned to the catering unit, far away from the stars. So began his journey towards becoming a film producer. However, little did Raymond visualise the trials and tribulations he would have to face in the process. After a couple of short stints as a ski slope help and an unpaid production assistant, Raymond received a call from a friend who was about to producing a film. Grabbing at his dream opportunity, he flew to the Big Apple. However, as luck would have it, the production process was due to start on September 11, 2001. Back in London and after a couple of jobs, Raymond decided to cross the Atlantic once again, to give his producer dream another go. He joined the Vancouver Film School to study film production. However, the skills he learnt for a year did not provide him a job in his chosen field. After a few stints, including one as a publicity and promotions assistant a manager of a cruise ship, and a truck team member, chance came Raymond’s way again as a contact told him about jobs in the UAE. He joined a magazine, which folded up in the aftermath of the global financial crisis, after which he joined a daily newspaper as feature writer. He kept at this for a time when, according to him, his feet started ‘itching’ again, thus taking him towards his dream job as a film producer, an opening for which he found in the UAE. Raymond does not tell us what happens in this part of his life, with the only information being “several months later” he fell out with his new boss, but “that’s another chapter for another day”. Some questions do come up as one reads through the book. One key question is, how did he find the money throughout? From his job descriptions, they weren’t really the kind that would have enabled him to survive the periods when he was not working. Was it the “bank of mum & dad”? Partly, I think so, as in the acknowledgements section, he thanks his mother and stepfather for their support, which included the word ‘financial’. Or was it unemployment/social security benefits? Because, let’s face facts, there is hardly anyone in the Third World who would be able to fund such endeavours from the jobs that Raymond says he has done. 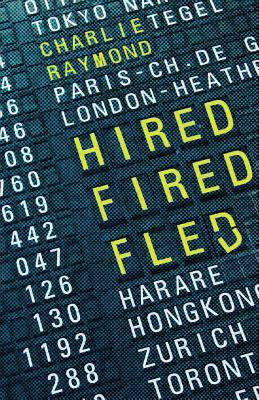 Raymond’s Hired, Fired, Fled is a sometimes comic, often tragic, but nonetheless engaging read. As he goes through his travails, he takes pains to shell out details of the social, economic and political background of the places he’s been to. Also, at the end of each chapter, he lists a set of “lessons learnt” points, all of which can be useful for someone starting out early in his career. However, his last chapter, frankly, falls through. What is meant (probably a noble effort) as a set of guidelines for the jobseeker, finally turns out to be too much of a sermon, and with all the quotes from famous people, he manages to effectively dilute what was otherwise a decent work.